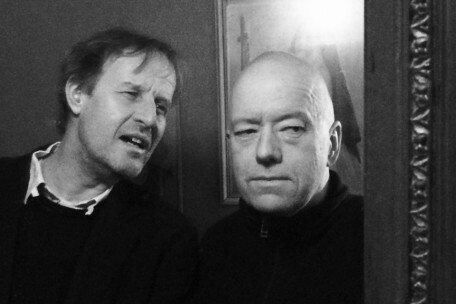 cm von hausswolff and martin rössel teamed up again to make music in march 2013 in palma de mallorca. the first time they met was in göteborg in 1980 when martin’s band »dom dummaste« played a club gig there, covering velvet underground songs. cm joined the band on guitar and violin for two concerts in linköping and göteborg in 1981, and martin assisted cm’s art performances at fylkingen and riddarhuset in stockholm the same year. now they’re working together again as »gomila park«, a name taken from the hotel with the same name in el terreno, palma, where their first recordings took place. this hotel is a place with many different rooms where some unexpected guests, unseen habitants and shadows from the past might dwell. we will investigate and document them all ... and of course you are welcome to witness it all.